Our Whisky Virgin heads to Campbeltown to learn all about terroir, but instead of finding out how an environment affects flavour in his whisky, he’s left with more questions than he started. Campbeltown character: Is Glen Scotia’s maritime flavour a result of the distillery’s coastal location? I finally did it. I made the pilgrimage north to the land of the haggis nacho and visited my first true life Scotch factory. 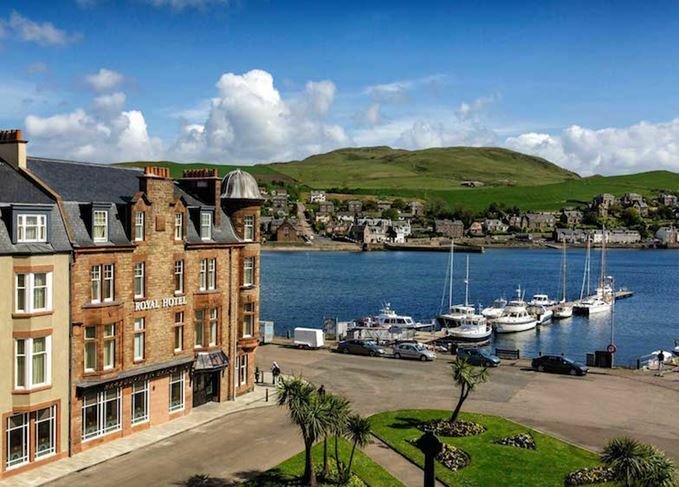 After two trains, a plane, and a mere three-hour car journey I found my fool-self in Campbeltown, in the extreme west of this currently United Kingdom. Once there, I made a beeline for Victorian whisky foundry Glen Scotia, where I finally saw first-hand how the old electric soup gets cooked. But what I found there wasn’t just any whisky, it was some of the boldest, oiliest, maddest gear in the whole damn game. Such, apparently, is the spirit made in this most tiny of whisky producing regions. But what makes said Scotch the way it is? Does the place a dram hails from really affect how it tastes? I’ll be honest, so far on my mission to get whisky-wise I’ve made do with a weak grasp on production. But visiting Glen Scotia – that most old-school of dram factories – and walking the line from grain silo to still house really helped me tighten my grip. Standing by those two copper stills I got perhaps too into shaking the Glen Scotia shot-caller’s hand and thanking him for showing me where whisky gets born. But then he went and blew my little mind by saying that the whisky’s actually made in the next building over. Intrigued? You better believe I was. From there, my host marched me to the old warehouses, where I realised what the eff he was talking about. Inside were what looked like billions of barrels, most old, some new, filled with spirit turning slowly but surely into whisky. That’s right – I remembered, improbably – Scotch malt spirit’s got to be in an oak barrel for three years before it’s properly whisky. How far I’ve come. We toasted my progress as a Whisky Virgin with a Scottish-sized dram straight from the barrel. Honestly, I felt like I was nosing Scotland itself. Like I was up a hill munching heather off its roots like a mad sheep, or in a river biting at salmon as they made their way upstream. Whisky from the cask is thick, and chunky, and tastes totally of itself. Amazing. As I chewed through it, Captain Scotia pointed out to me that the windows of the ancient warehouse have no glass in them. Big deal, I thought, neither do the ones at my gaff. But then I got what he was talking about. Just metres away was Campbeltown harbour and beyond that, the sea. ‘This thing tastes like that thing!’ I realised aloud. There was an ocean-ness there, a funky marine vibe. This thing, did indeed, taste like that thing. Pretty cool, right? I left Campbeltown feeling wiser and heavier – haggis nachos, pal – and excited to share my findings with the whisky fam’ back home. But when I spun out my newfound belief that Scotch tastes like where it comes from I was met by many a rolled eye and shook head. Turns out this is a controversial matter. While I found some support for the idea that whisky-where can affect whisky-taste, a lot of peeps were keen to tell me that it doesn’t always. But apparently this isn’t necessarily true. Glen Scotia might have malt maturing just over from the main plant, but apparently some distilleries send barrels off to big centralised warehouses, perhaps hundreds of miles away. So, a malt that tastes coastal or island-y might have turned into whisky on an industrial estate or at a totally different distillery. Probs nothing wrong with that but it does throw shade on the idea that hooch tastes that way because of where it comes from. Also, apparently not a dead cert. Turns out barley for the whisky mills is mostly bought on the open market and malted/peated to spec. Or so a local whisky dealer told me, with all the joy of someone informing a child that Father Christmas has various Sherry-related illnesses and his reindeer carry Lyme disease. It was pointed out to me that there are un-smoky, light Islay single malts and rich, smoky drams made by the River Spey. Again, place of origin might be a factor and it might not. So, instead of finding answers to my questions about how whisky gets its flavours in its homeland, I’m now not even sure if it does. I didn’t realise that in my quest for whisky wise-ness I might find myself with questions that don’t actually have an answer. What I did find out though is that there are firms up there in the land we call ‘Scot’ diving deep into the connection between place and flavour. Glen Scotia’s neighbour Springbank makes a ‘local barley’ series of malts using only grain produced in their end. Pronunciation-defying Islay bad lad Bruichladdich is apparently also in on this game, commissioning nearby farms to grow old-school barley varieties for their mega-local brews. I’m also told there’s a new wave of small farm operations like Kilchoman, also on Islay, and Daftmill, in the Lowlands, making long-term plans to keep things local, and do as much of the production process as possible on one site. Will these experiments prove how and why geography spins flavour, from grain to plant to warehouse? IDK, mate – we’ll find out on the way, I reckon. So, it turns out that you can’t assume anything about what your whisky’s going to taste like based on where it got made. But, you still might get odd glimpses of the malty homeland when you’re knocking down a dram. With the proper scientific connections between flavour and landscape still to be figured out, I reckon I can still crack an oily, seaweed-y Glen Scotia and imagine I’m back in Campbeltown. I can still almost taste the sea in that whisky and imagine it sleeping in a barrel surrounded by ocean air, year after year, where Scotland breaks into the Atlantic. A bit daft, maybe. But there’s no harm in that, eh?